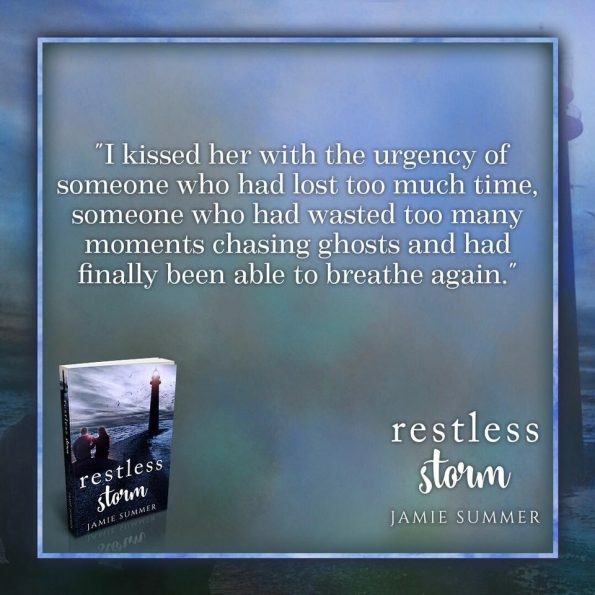 Review – Restless Storm by Jamie Summer – 5 Heart Breaking, Beautiful Stars!!! 5 Heart Breaking, Beautiful Stars!!! When faced with returning to the Island, Maddy once called home, old feelings resurface. Will Maddy find solace in Crystal Cove once again, or will the impending storm destroy the possibility of any second chances? Jamie summer writes captivatingly and beautifully; she lures you into the story in a way you find yourself never wanting to leave. Restless Storm is a beautiful work of art. As your drawn into the beautiful Island of Crystal Cove, you start to feel a connection to the Island yourself. You find your heart breaking with the fear, these people are facing; hoping, and praying, they won’t suffer any kind of loss during the approaching storm. Although this story is ultimately a second chance love story, there is a lot more to this story than just the relationship between Maddy and Jake. This is about a community and how this community come together in times of need, how everyone to them is family and they will always have each other’s back. How the place Maddy once called home and its people, can help to heal her broken heart, showing her, everything she needs, is on the Island. Through both Maddy and Jake’s eyes we experience, how strong, caring, loving, and accepting the people of Crystal Cove are and how lucky they feel to be cared for and accepted by this community. I was routing for Maddy and Jake from the beginning, they had been dealt a rough path, especially Maddy and she was finding it hard to find her future path. The hurt of her father’s death had given Maddy the feeling that she had lost everything and that the Island had destroyed all she had ever loved. It was clear how deep the love between Maddy and Jake ran, they were meant to be. This is the first book of Jamie Summer’s I have read, and it won’t be my last. Restless Storm is a standalone contemporary romance novel, perfect for all romance readers.